Yet more products added to the site today. I am now able to supply top quality grower bags at a great price of £5.75inc vat. A couple of seed potatoes and some compost is all you will need and then your on your way to bumper crops of fresh potatoes as and when you need them. I can now sell hessian sacks for people to store their potatoes in. I have now got my logo branded on to these top quality sacks and I think they look rather good. Each sack can hold 25kg/56lbs. Once the potatoes are harvested they should be placed into these sacks and stored in a cool,Dark frost free area. A common mistake is for people to think that the light can not get through the hessian sack, but it does and makes your potatoes green and inedible as they are poisonous when green. The hessian allows the potatoes to breathe and stops them sweating which would cause your crop to decay. I have updated my point of sale cards with more information and set them out a bit better. The weather is so much better today. Today we will give all of the machines a bit of a going over and check they are all in top working order. Well today has been a very busy day. We have had 107 tonnes of potatoes ordered today and we have already started to grade a few of our varieties in preperation for the big rush that always happens. We have sorted through the pink fir apple today and they are the best we have had for years. The wet weather has taken its toll on some of the local seed growers near us and one poor man has been unable to lift a single potato this year due to flooding. Best of all though is that Stephen and Peter at Callisti have updated the website with even more security and features to make it easier for my loyal customers to purchase seed potatoes from. Next on the agenda is a newsletter and free videos of how to plant potatoes and harvest potatoes. I could do a video about how to detect disease in your crops but it is all about getting time to do these things. By signing up to my promotional mail list you will also receive special discounts on our potatoes and we will soon be able to offer our brand new hessian sacks for you to purchase at knock down prices.Keep checking this blog and the website to see when it goes live and sign up for free. If you have anymore suggestions please feel free to add them. We are constantly updating our new website and adding new products and features. we now have over 70 varieties for sale from our online and are constantly looking for more to add. 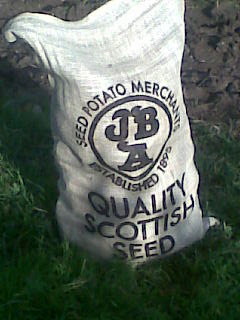 We should be supplying our new hessian sacks very soon so that you can harvest your seed potatoes and store them easily. If you have any products you would like us to supply then please email us.